What do you do when you have an industrial space but your vibe is more boho? This project, tackled by Melissa Lee of design firm Bespoke Only, should be your guide. 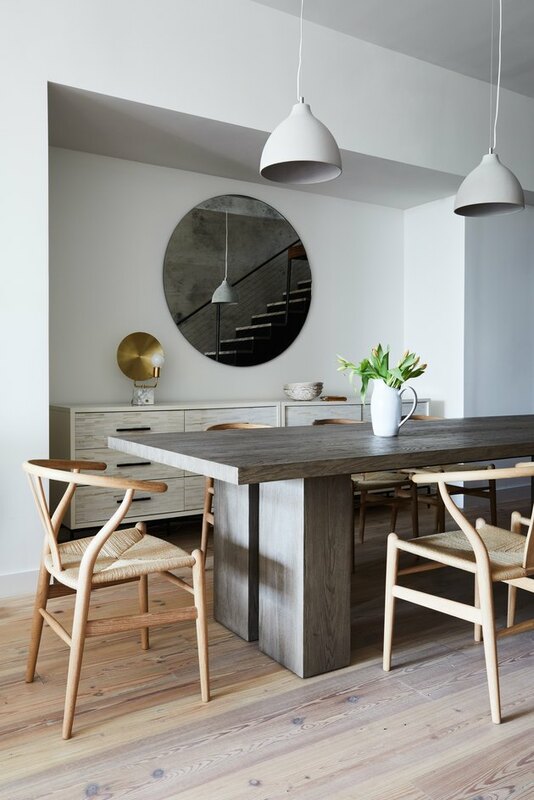 Lee first looked to textures that could soften the modern apartment, located on the waterfront of Brooklyn Heights, and so she brought in varying shades of reclaimed wood to offset the heavy use of steel in the architecture. Then came a palette of muted earth tones, including gray, flax, and indigo. Natural and sustainable materials took priority, as well as a focus on sourcing local artisans, thanks to Lee's commitment to reducing the project's carbon footprint. The finished product is polished yet peaceful — the perfect respite from city life. The walls of the apartment are painted in a crisp white, creating a clean backdrop for the muted tones of the furniture and decor. 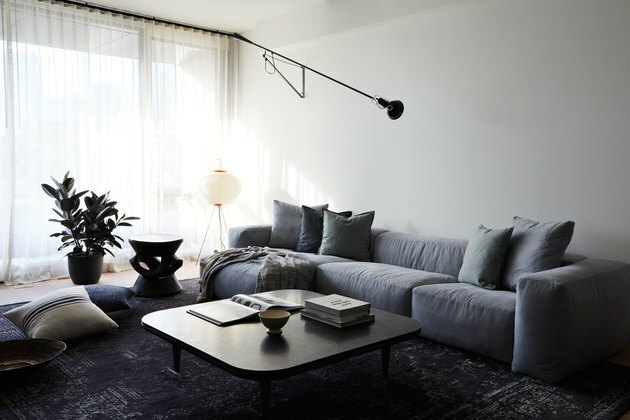 A wall light by Paolo Rizzatto for Flos illuminates the living room, which is outfitted with a linen sectional from Homestories, a marble coffee table by Space Copenhagen, and a Loloi rug. 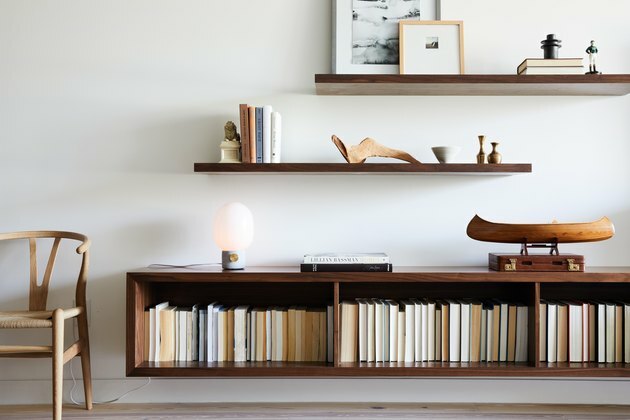 Bespoke Only collaborated with architect Albert Pyun of DBC on the custom floating shelves and console, which display the couple's collections and a lamp from Menu. 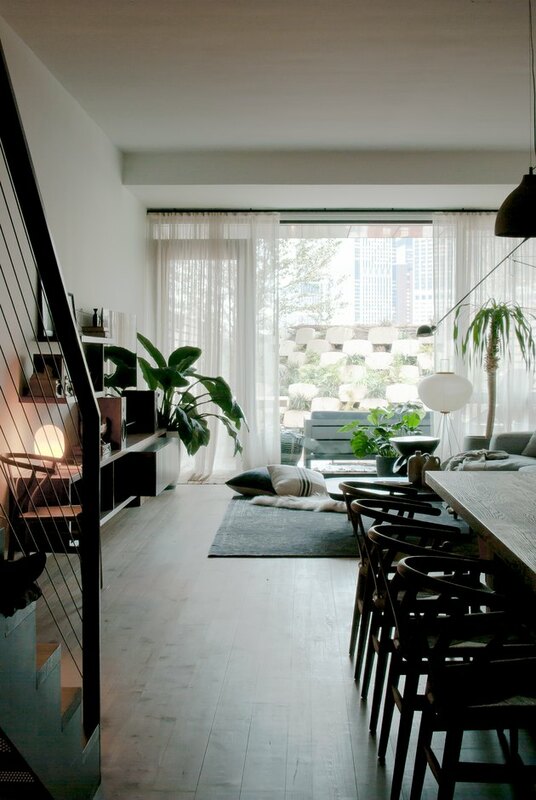 Sheer stonewashed linen drapes soften the light from the adjacent brick patio. The apartment's floors are reclaimed oak. The dining room's Restoration Hardware table offers plenty of seating for dinner parties. An antiqued mirror from Mirror Coop reflects the Decode pendants. Wishbone chairs by Hans Wegner create a soft contrast with the sharp lines of the dining table. 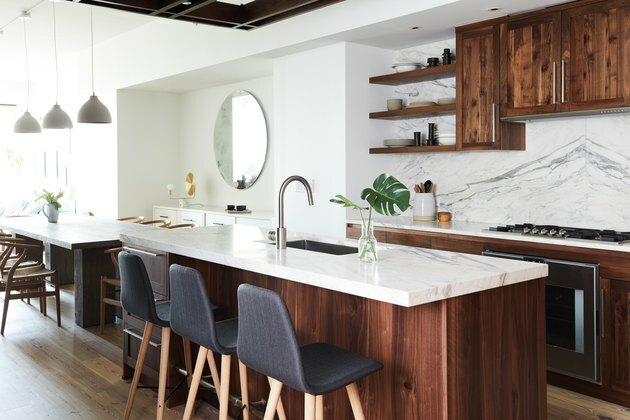 Warm wood cabinetry and marble countertops and backsplash give the kitchen a natural vibe. Bolia barstools are pulled up to the center island for casual dining. 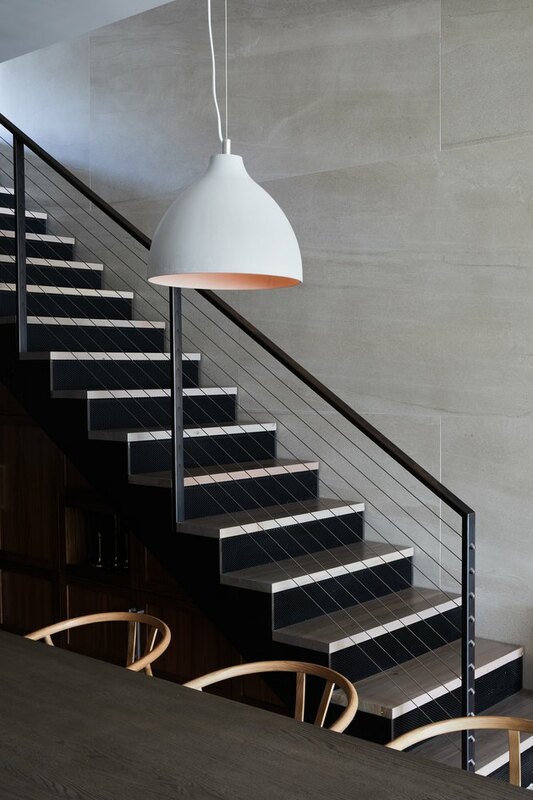 Cool gray tiles by Porcelanosa line the stairway to the upper level. 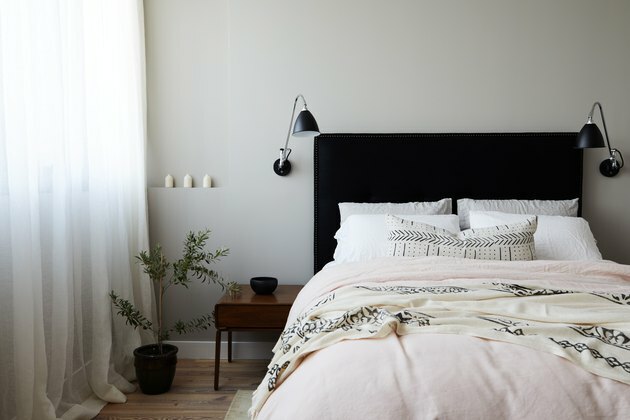 In the master bedroom, Lee installed wall sconces by Gubi, which complement the apartment's industrial architecture. The bedside table is by TRNK. The bedroom's terrace, which is furnished with lounge chairs by Cane-line, has views of the Manhattan skyline. 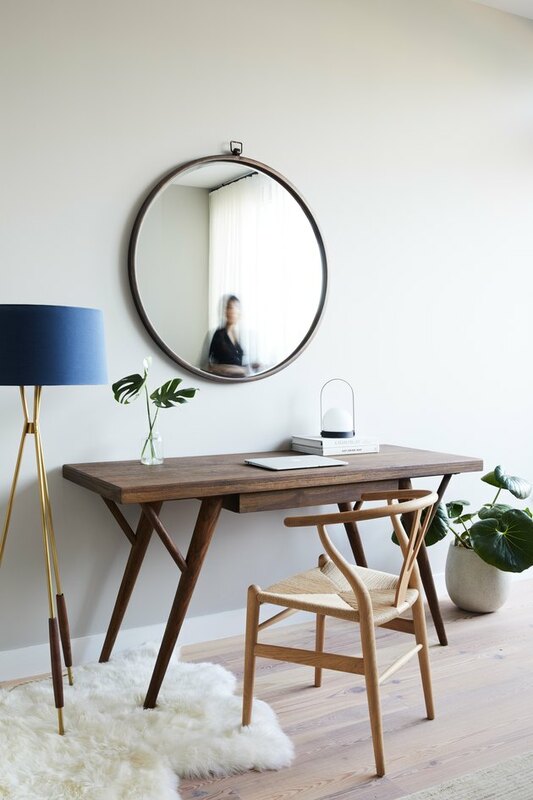 A Wishbone chair and a mirror and desk from One Kings Lane create a work area in the master bedroom.